It is a rather quirky South African historical fact that in 1924 an arch verkrampte Afrikaner lawyer/politician, a man who would become the Prime Minister of the country in the 50’s, had a relationship, and brief marriage, with a bohemian, hard drinking, lesbian actress. The lawyer/politician was JG Strijdom - commonly known as Hans Strydom – one of the chief architects of the Apartheid policy adopted by National Party. The actress was South African born Margaretha Van Hulsteyn who under the stage name Marda Vanne achieved considerable success on the theatre stages of London and elsewhere. Living proof perhaps that with humans opposites most certainly do attract. As interesting as this ill-fated union may have been, I am not sure it that justifies a book of 330-plus pages. This seems also to be the problem faced by author David Bloomberg as well in his work of biographical fiction. Despite his liberal use of what he calls creative license he has produced what is more of a biography of Marda Vanne than anything else. Not that this is a bad thing. Marda Vanne most definitely lived a life which was diverse, captivating and interesting enough to warrant a biography in its own right. She was the daughter of respected Pretoria lawyer Sir Willem and Lady Margaretha Van Hulsteyn. She grew up as a feisty tomboy who earned the nickname of Scrappy for her propensity for getting into fights and scrapes. At an early age, she fell in love with the theatre and against all odds managed to persuade her rather conservative parents to allow her to travel to London to study acting. While in London she changed her name to Marda Vanne and started to make a considerable name for herself on the stage. She also started a life-long relationship with one of the leading actresses of the day, Gwen Ffrangcon-Davies. While on a visit home to her parents, she met the uncompromising and radical politician JG Strijdom who known as the Lion of the North. It is from their brief relationship and marriage that the title of this book is derived. Later, Marda Vanne re-established her relationship with Gwen Ffrangcon-Davies. They both enjoyed very successful acting careers in the UK and South Africa and later in television and film. They also assisted in the establishment of the National Theatre Organisation in this country. Author David Bloomberg is in himself an interesting character. He established a name for himself in the theatre world, as a lawyer and as a businessman. His long service in civic politics led to him serving as the mayor of Cape Town between 1973 and 1975. He now lives in Switzerland. 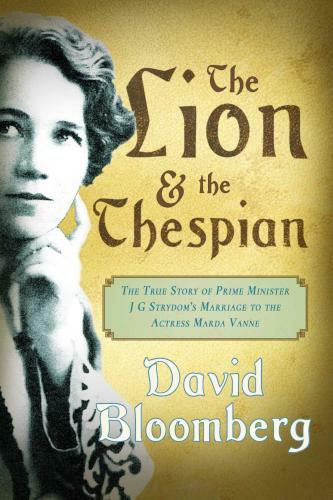 The Lion & The Thespian is his seventh book. In this book, I find his tendency to use dialogue to tell the story quite irritating. It leads to ponderous, unnatural and over-long exchanges between the characters. That having been said, if one regards the story as a biography of Marda Vanne and not just about her brief marriage, as the title suggests, then it does have interest value. It also serves as a thought-provoking record of the birth and growth of the draconian Apartheid system which was imposed on the country by the likes of JG Strijdom and his cohorts in the National Party. As long as the reader is not expecting a love story, there is plenty to enjoy in this account of a slice of history from our very disparate and complicated country.